As we throw a few fireworks in the air and whoop it up for our own independence this weekend, take a quick peek at some other awesome celebrations of freedom across the globe. Get out the grill, light the sparklers and don your most brilliant reds, whites and blues. Independence Day Weekend is here! But the United States is not the only country to hold this kind of annual celebration of freedom. People of different nations also commemorate their respective Independence Days in many unique and entertaining ways. If you’re travelling, independence day holidays can provide a great opportunity to party with the locals and, just as importantly, learn about their history and culture. Here are four super-fun summer celebrations from around the world that help us all remember how awesome freedom really is. Every year, billions of people in India commemorate the end of three centuries of British rule by adorning their houses, offices, and schools with the colors of the Indian flag. Citizens sing the national anthem and pay respect to the national flag all morning and families gather to watch the annual flag hoisting ceremony, broadcasted live from the Red Fort in New Delhi. Participate! For Indians, kite flying symbolizes freedom. All over the country, the skies are dotted with countless kites of various shapes and shades flown from the rooftops, and tourists are welcome to join in the fun. The colorful day is a perfect time to have a picnic. Contrary to popular belief, Cinco de Mayo is not Mexico’s Independence Day. Mexicans observe Independence Day in September to memorialize the Grito de Dolores – the battle cry of the Mexican War of Independence uttered by Miguel Hidalgo y Costilla, a Roman Catholic priest from the small town of Dolores, as Mexico broke free of Spanish rule. All over the country, the holiday is marked by parades, concerts, and parties. Enjoy the Viva Mexico! fireworks in this stunning display. Get in on the fiesta! Celebration begin on the night of September 15 across the nation. In Mexico City, the epicenter for the festivities is the Zócalo, one of the world’s largest city squares; more than half a million other people gather there each year. It is a tradition for the president to repeat the cry of patriotism, followed by enthusiast response of “¡Viva!” by the lively crowd. At the end, spectacular fireworks light up the night sky. When Ghana gained its independence from the United Kingdom in 1957, it became the first African country to do so. 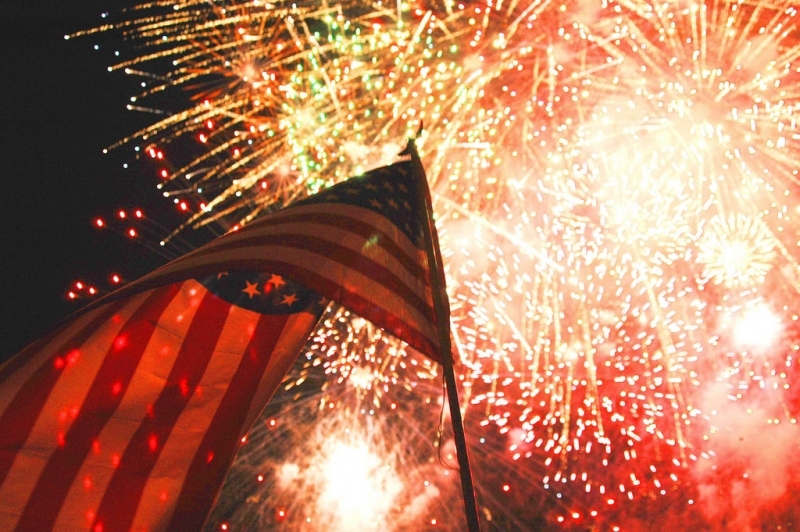 Today, the country commemorates the historic event annually with fireworks, parades, and marches. But, the celebrations are not complete without street parties and jams, a uniquely Ghanaian tradition. What to do? Street parties are not enough? How about beach parties? The coastal region celebrates Independence Day on the beach with music and dances that marry the elements of West African tradition with hip hop. A famous regatta competition takes place in the fishing village of Shama. In the morning, the eyes of all Indonesians are on the National Palace, where a solemn flag ceremony is held to honor the republic. High school students from all over the country are carefully selected by the government to do the honor of hoisting the flag. Immediately after the ceremony, spirits lift and neighborhoods gear up for music-fueled street fests. Shimmy your way up that greasy palm tree! On this day in Indonesia, non-competitive sports like panjat pinang, which challenges people to scale slippery trees in hopes of grabbing the prizes that have been placed at the top, are the main events. Panjat pinang symbolizes the struggle of Indonesians to achieve their independence from the Dutch. If getting all oily is not your thing, then you can join the shrimp chip-eating contest. Delicious!